The good news… Digital transformation isn’t about technology, and it didn’t kill the brick and mortar. Amazon has clearly made a huge commitment to Brick and Mortar by launching bookstores and purchasing Wholefoods. And, while other brick and mortar consumer electronics retailers have gone out of business, Best Buy is doing just fine. Digital Transformation is about leveraging technology to create an amazing customer experience for less money. Digital Transformation is also about creating an amazing employee experience and giving them the tech they need to connect and provide a concierge-like experience to your customers. Things like analytics, IoT, cloud, social, AI and mobile have given brands the ability to connect individually with their customers, at the speed of “now,” where, when, and how your customers want it. Digital has ushered in the Experience Age and has changed our consumer expectations. According to Gaber George Burt in a Harvard Business Review Article titled “Keeping Customers Continuously Infatuated,” it’s no longer about satisfying customers because satisfaction is fleeting, what is critical is to infatuate them over and over again. There is no such thing as customer loyalty. If you aren’t constantly introducing new experiences, color lines, flavors, movies, or products, your customers are at risk of becoming infatuated with a competitor. And, people no longer just buy products, they are seeking experiences. That means that people want to buy products from companies that consistently create an experience for them. Most executives and their teams still think that Digital Transformation is about technology deployment. They don’t understand that their customers want to interact with them differently, that they are seeking experiences. This requires new business models that foster connection and experience. Then... Technology can be deployed to enhance that connection and the customer experience. A highly optimized Organizational Change Engine (OCE) is comprised of 7 distinct disciplines. 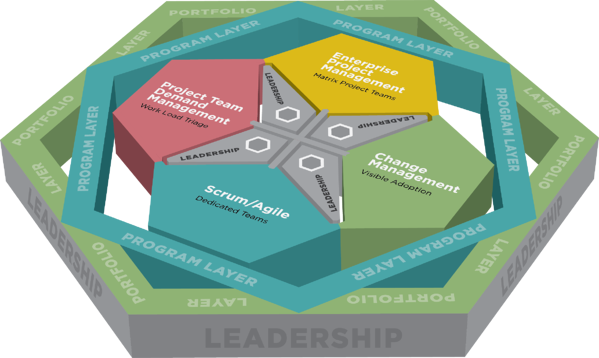 A single Agile/Scrum competency, or Six Sigma, or Traditional Project Management approach alone, won’t drive change across an entire organization as efficiently and effectively with near 100% adoption on day one. It takes all 7 OCE disciplines working in concert. Most organizations deploy technology to solve a problem and then customize it to match the way their teams have historically worked. This only results in a very expensive deployment and a re-branding of the status quo. Consulting companies prove on a daily basis that increasing organizational effectiveness doesn’t start with technology. We come to the table with our expertise, have to quickly learn our client's culture, and are expected to adapt how we deliver to their process and technology. To help our clients drive change efficiently and effectively with near 100% adoption on day one, we have learned that we need to hire great people, invest in their OCE training and provide them the resources they need to be successful in any environment. Transformation starts with people, culture and then technology. An organization's ability to drive change fast enough to win the #RacetoSustain starts by addressing your organizational culture and your business model. Take the time to imagine how your customers want to interact with your company in the Experience Age. Define a digital strategy by imagining how you could use technology to enable your team members to connect deeply 24/7 with your customers. Then invest by training and cultivating the mastery of the 7 OCE disciplines in your team members, while incrementally deploying technology that supports your new business models. Remember #BabyStepsAreGold! The race to sustain customer infatuation is here. The way we do business has fundamentally changed! Winning the #RaceToSustain requires a highly optimized change engine.